Some installments of Slummin’ It take place almost by accident. For example, I might find myself at a rest stop at 3am and have no option but Burger King. Others grow naturally, emerging where late night revelry meets enthusiasm for a greasy burger. This installment I knew had to happen as soon as I saw an advertisement for the sandwich. After all, it’s not every day that one of the major players in fast food tries their hand at guacamole. Going in, I figured I had this sandwich pegged. I was ready to come back here and holler about a crime against avocados, about know-nothing eggheads overstepping their homogenized, corporate world. But honestly, the sandwich could have been a lot worse. The guacamole is loose and smooth, a far cry from the many kinds of guacamole we all know and love, but in the grand scheme of processed avocado product, it was one of the better ones I’ve come across. It had a bright, strong avocado flavor, and while the texture wasn’t ideal it isn’t like I haven’t run across smooth guacamole at plenty of taquerias. The sandwich includes both cheese and mayonnaise, which, given the avocado, really aren’t necessary. That said, they don’t interfere too much, and all you can really taste is the chicken, the avocado, and the bacon. Looking at what I’m writing right now, I really do feel like I should be taking a more negative tack. But to do so would be dishonest, because the sandwich wasn’t that bad. I should be clear: It was a fast food sandwich with sub-par processed guacamole, needless cheese and mayo, and a limp, tasteless bun. This is never going to compare with any sandwich made with even a single ounce of effort or thought. 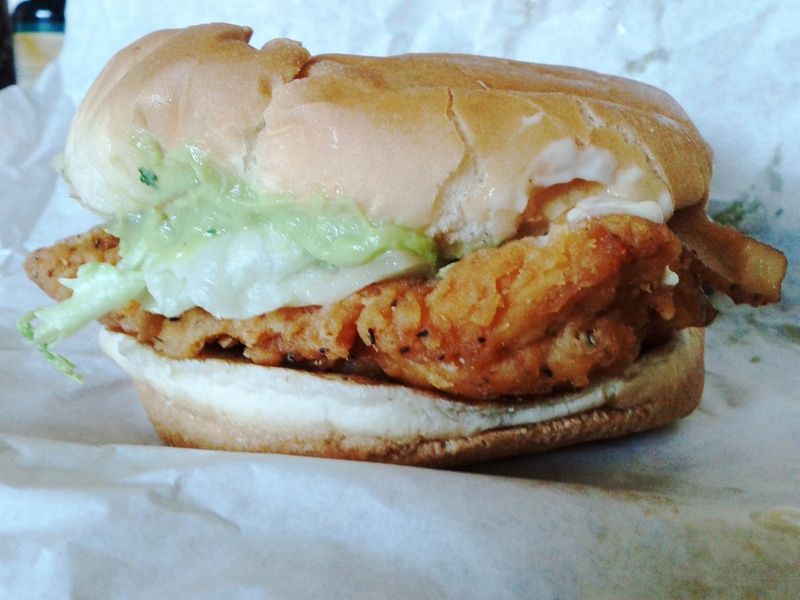 But in the wasteland that is fast food chicken sandwiches, I think this sandwich ranks pretty high. Ultimately, I think processed sub-par guacamole is still a far sight better than a standard gloppy ranch dressing, and this sandwich reflects that disparity in quality. That’s the power of an avocado for you, I guess, that even run through some unimaginable factory, treated with all manner of powders and chemicals, piped out, shipped across the country, doled out by some uncaring teenager in a paper hat, it’s still got enough gumption left to pull a mediocre chicken sandwich up to a tolerable level. I’ll understand if you’re hesitant to believe me on this one, but I can only report on what is. This is a tasty sandwich, far tastier than it had any right to be. This entry was posted in Sandwich Reviews, Slummin' It and tagged Chicken, Reviews by Pete, Sandwiches I Have Eaten, Sandwiches Made For Me, Slummin It by Pete. Bookmark the permalink. I’ve been waiting all weekend for this review. Now I know I can at least give the sandwich a shot (like you the ads have had me hooked) with minimal chance of immediate regret. By the way, you touched on something I always think about when I do end up getting fast-food; is there anything worse than fast-food ranch? Almost always a flavorless goo. No zing, no pep, just there. Fast food ranch is some sort of signal, I think, an intentionally woeful accouterment, as if there to inform you that yes, it really is this bad.